California ( pronounced [ˌkæ.lɪ.ˈfɔɹ.njə]) is the most populous state of the United States. Located on the Pacific coast of North America, it is bordered by Oregon, Nevada, Arizona and Mexico. The state's four largest cities are Los Angeles, San Diego, San Jose and San Francisco. California is known for its pleasant climate and ethnically diverse population. The state has 58 counties. Inhabited by indigenous people for millennia, California was first colonized by the Spanish in 1769, and after Mexican independence in 1821, continued as part of Mexico. Following a brief period as the independent California Republic in 1846, California was annexed by the United States that same year, and was admitted to the Union as the thirty-first state on September 9, 1850. California's diverse geography ranges from the sandy beaches of the Pacific to the rugged, snow-capped Sierra Nevada mountains in the east. The central portion of the state is dominated by the California Central Valley, one of the most vital agricultural areas in the country. The Sierra Nevada contain Yosemite Valley, famous for its glacially-carved domes, and Sequoia National Park, home to the largest living things on Earth, the Giant Sequoia trees, and the highest point in the contiguous United States, Mount Whitney. The tallest living things on Earth, ancient Redwood trees, dot the Northern California coastline. California is also home to the lowest and hottest place in the Western Hemisphere, Death Valley. Bristlecone pines located in California's White Mountains are the oldest known trees in the world; one has an age of 4,700 years. The California Gold Rush, beginning in 1848 dramatically changed California with an influx of population and an economic boom. 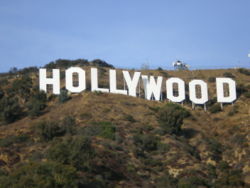 The early part of the 20th century was marked by California's becoming the centre of the entertainment industry, in addition to the beginning of growth of a large tourism sector. The Central Valley is home to California's important large agricultural industry. Other important industries have included the aerospace and oil industries. In recent decades, California has become a global leader in computers and information technology. Indeed, if California were a country, it would rank among the largest 10 economies of the world.
" I Love You, California"
California originally referred to the entire region composed of the current U.S. state of California, plus all or parts of Nevada, Utah, Arizona, and Wyoming, and the Mexican peninsula now known as Baja California. The name California is most commonly believed derived from a storied paradise peopled by black Amazons and ruled by Queen Califia. The myth of Califia is recorded in a 1510 work The Exploits of Esplandian, written as a sequel to Amadís de Gaula by Spanish adventure writer García Ordonez Rodriguez de Montalvo. The kingdom of Queen Califia, according to Montalvo, was said to be a remote land inhabited by griffins and other strange beasts and rich in gold. Know ye that at the right hand of the Indies there is an island named California, very close to that part of the terrestrial Paradise, which was inhabited by black women, without a single man among them, and that they lived in the manner of Amazons. They were robust of body, with strong and passionate hearts and great virtues. The island itself is one of the wildest in the world on account of the bold and craggy rocks. Their weapons were all made of gold. The island everywhere abounds with gold and precious stones, and upon it no other metal was found. It is thought that the myth of Califia later helped fuel Spanish exploration in the New World. California borders the Pacific Ocean, Oregon, Nevada, Arizona, and the Mexican state of Baja California. With an area of 160,000 square miles ( 411,000 km²) it is the third largest state in the U.S and is larger than Germany in size. California's geography is rich, complex, and varied. In the middle of the state lies the California Central Valley, bounded by the coastal mountain ranges in the west, the Sierra Nevada to the east, the Cascade Range in the north and the Tehachapi Mountains in the south. The Central Valley is California's agricultural heartland and grows a large portion of the United States's food. The northern half is known as the "Sacramento Valley" (drained by the Sacramento River), while southern part of the valley, which is part desert, is known as the "San Joaquin Valley" (drained by the San Joaquin River). With dredging, the Sacramento and the San Joaquin Rivers have remained sufficiently deep that several inland cities are seaports. The Sacramento-San Joaquin Bay Delta serves as the water supply hub for much of the state's population. The Channel Islands are located off the southern coast. The Sierra Nevada (meaning "snowy range" in Spanish) include the highest peak in the contiguous forty-eight states, Mount Whitney, at 14,494 ft (4418 m), world-famous Yosemite National Park, and a deep freshwater lake, Lake Tahoe, the largest lake in the state by volume. To the east of the Sierra Nevada are Owens Valley and Mono Lake, an essential migratory bird habitat. In the western part of the state is Clear Lake, California's largest freshwater lake by area. The Sierra Nevada reaches arctic temperatures in the winter and has several dozen small glaciers, including the southernmost glacier in the U.S. (Palisade Glacier). About 35% of the state's total surface area is covered by forests, and California's diversity of pine species is unmatched by any other state. California contains more forestland than any other state except Alaska. In the south is a large inland salt lake, the Salton Sea. Deserts in California make up about 25% of the total surface area. The south-central desert is called the Mojave; to the northeast of the Mojave lies Death Valley, which contains the lowest, hottest point in North America, Badwater Flat. The lowest point of Death Valley and the peak of Mount Whitney are less than 200 miles apart. Indeed, almost all of southeastern California is arid, hot desert, with routine extreme high temperatures during the summer. Along the California coast are several major metropolitan areas, including San Jose-San Francisco- Oakland, Los Angeles- Long Beach, Santa Ana-Irvine-Anaheim, and San Diego. California is famous for earthquakes due to a number of faults, in particular the San Andreas Fault. California is also home to several volcanoes, including Lassen Peak, which erupted from 1914 and 1921, and Mount Shasta. California climate varies from subtropical to subarctic. 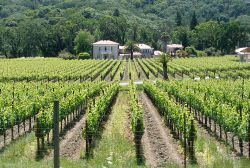 Most of the state has a Mediterranean climate, with cool, rainy winters and dry summers. The cool California Current offshore often creates summer fog near the coast. Further inland, the climate is colder winters and hotter summers. Northern parts of the state average higher annual rainfall than the south. California's mountain ranges influence the climate as well: some of the rainiest parts of the state are west-facing mountain slopes. Northwestern California has a temperate climate and the Central Valley has a Mediterranean climate but with greater temperature extremes than the coast. The high mountains, including the Sierra Nevada, have a mountain climate with snow in winter and mild to moderate heat in summer. The east side of California's mountains has a drier rain shadow. The low deserts east of the southern California mountains have hot summers and nearly frostless mild winters; the higher elevation deserts of eastern California have hot summers and cold winters. In Death Valley, the highest temperature in the Western Hemisphere, 134 °F (56.6 °C), was recorded July 10, 1913. Ecologically, California is one of the richest and most diverse parts of the world and includes some of the most endangered ecological communities. California is part of the Nearctic ecozone and spans a number of terrestrial ecoregions. California's large number of endemic species includes relic species which have died out elsewhere, such as the Catalina Ironwood (Lyonothamnus floribundus). Many other endemics originated through differentiation or adaptive radiation, whereby multiple species develop from a common ancestor to take advantage of diverse ecological conditions (such as the California lilac ( Ceanothus). Many California endemics have become endangered, as urbanization, logging, overgrazing, and the introduction of exotic species have encroached on their habitat. California boasts several superlatives in its collection of flora; the largest trees, the tallest trees, and the oldest trees. California's native grasses are perennials. After European contact, these were generally replaced by invasive species of European annual grasses; and, in modern times, California's hills turn a characteristic golden brown in summer. 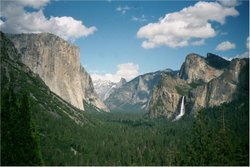 The U.S. National Park System controls a large and diverse group of California parks. The most prominent is Yosemite National Park. Half Dome, in Yosemite, figures prominently on the reverse side of the California state quarter. Other prominent parks are the Kings Canyon- Sequoia National Park complex and Redwood National Park. Settled by successive waves of arrivals during the last 10,000 years, California was one of the most culturally and linguistically diverse areas in pre-Columbian North America; the area was inhabited by more than 70 distinct groups of Native Americans . Large, settled populations lived on the coast and hunted sea mammals, fished for salmon, and gathered shellfish, while groups in the interior hunted terrestrial game and gathered nuts, acorns, and berries. California groups also were diverse in their political organization with bands, tribes, tribelets, and on the resource-rich coasts, large chiefdoms, such as the Chumash, Pomo and Salinan. Trade, intermarriage, and military alliances fostered many social and economic relationships among the diverse groups. The first European to explore the coast as far north as the Russian River was João Rodrigues Cabrilho, in 1542, sailing for the Spanish Crown. The English explorer Francis Drake also explored and claimed the California coast in 1579. Spanish traders made unintended visits with the Manila Galleons as early as 1565. Sebastián Vizcaíno explored and mapped the coast of California in 1602. Beginning in 1769, Spanish missionaries set up California Missions along the California coast, with small towns and presidios. In 1821, the Mexican War of Independence gave Mexico (including California) independence from Spain; for the following quarter century, California remained a remote northern province of the nation of Mexico. Cattle ranches, or ranchos, emerged as the dominant institutions of Mexican California. After Mexican independence from Spain, the chain of missions became the property of the Mexican government, and were dissolved and abandoned by 1832. Beginning in the 1820s, trappers and settlers from the United States and Canada began to arrive, harbingers of the great changes that would sweep California. These new arrivals used the Siskiyou Trail, California Trail, and Old Spanish Trail to cross the rugged mountains and harsh deserts surrounding California. In this period, Imperial Russia explored parts of California, and established a trading post at Fort Ross. In 1846, at the outset of the Mexican-American War (1846-1848), the California Republic was founded and the Bear Flag was flown, which featured a grizzly bear and a star. The Republic came to a sudden end, however, when Commodore John D. Sloat of the United States Navy sailed into San Francisco Bay and claimed California for the United States. Following the war, the region was divided between Mexico and the United States. The Mexican portion, Baja (lower) California was later divided into the states of Baja California and Baja California Sur. 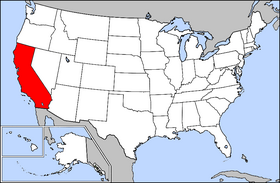 The western part of the U.S. portion, Alta (upper) California, was to become the U.S. state of California. In 1848, the non-native population of California has been estimated to be no more than 15,000. But after gold was discovered, the population burgeoned with U.S. citizens, Europeans, and other immigrants during the great California Gold Rush. In 1850, California was admitted to the United States as a free state (one in which slavery was prohibited). At first, travel between California and the central and eastern parts of the United States was time-consuming and dangerous. A more direct connection came in 1869 with the completion of the First Transcontinental Railroad. After this rail link was established, hundreds of thousands of U.S. citizens came west, where new Californians were discovering that land in the state, if irrigated during the dry summer months, was extremely well-suited to fruit cultivation and agriculture in general. Citrus was widely grown (especially oranges), and the foundation was laid for the state's prodigious agricultural production. During the early 20th century, migration to California accelerated with the completion of major transcontinental highways like the Lincoln Highway and Route 66. In the period from 1900 to 1965, the population grew from fewer than one million to become the most populous state in the Union. From 1965 to the present, the population changed radically and became one of the most diverse in the world. The state is regarded a world centre of engineering businesses, the entertainment and music industries, and of U.S. agricultural production. As of 2006, California has an estimated population of 37,172,015, and is the 13th fastest-growing state. This includes a natural increase since the last census of 1,557,112 people (that is 2,781,539 births minus 1,224,427 deaths) and an increase due to net migration of 751,419 people into the state. Immigration from outside the United States resulted in a net increase of 1,415,879 people, and migration within the country produced a net increase of 564,100 people, and a decrease of 21,669. More than 12 percent of U.S. citizens live in California and its population is larger than all but 33 countries. California has eight of the top 50 US cities in terms of population. Los Angeles is the nation's second-largest city with a population of 3,845,541 people, followed by San Diego (8th), San Jose (10th), San Francisco (14th), Long Beach (34th), Fresno (37th), Sacramento (38th) and Oakland (44th). California lacks a majority ethnic group, and is one of four " majority-minority states." The 2000 census reported that less than half of Californians were non-Hispanic White (49%). Twenty-seven per cent of the population is Hispanic or Latino, followed by 12 percent Asian American and Pacific Islander, 7 percent African American or black, 5 percent Native American, and 5 percent biracial or multiracial. The largest named ancestries in California are Mexican (25%), German (9%), Irish (7.7%), English (7.4%) and Filipino (6%), but includes 65 other ethnicities from Albanian to Somali. There are substantial Chinese American communities in the San Francisco Bay Area and Los Angeles County; there are large Korean American, Japanese American, Cambodian American, Vietnamese American, Indian American, Persian American, and Arab American communities in the Greater Los Angeles Area and in other areas of the state. California has the largest population of African Americans in the western U.S., an estimated 1.5 million residents. California's Native American population of 350,000 is the most of any state. As of 2000, 60.5% of California residents age five and older are monolingual and speak only English at home. In addition to any other language that may be spoken (such as English), 25.8% speak Spanish, 2.6% speak Mandarin Chinese, and 2.0% speak Tagalog. Over 200 languages are known to be spoken and read in California. There are a significant number of indigenous languages and dialects in California, making California one of the most linguistically diverse areas in the world. All of California's indigenous languages are endangered, although there are now some efforts toward language revitalization. The state has the most Roman Catholics of any state, a large American Jewish community, and a rapidly-growing Islamic population. The Hollywood Sign is the best-known symbol of California's huge entertainment industry. Silicon Valley is the centre of California's computer industry, just south of San Francisco. As of 2005, California's GDP is larger than all but seven countries in the world (and all but eight countries by Purchasing Power Parity). California is responsible for 13% of the United States gross domestic product (GDP). As of 2005, The gross state product (GSP) is about $1.62 trillion, the largest in the country. The predominant industry, more than twice as large as the next, is agriculture, (including fruit, vegetables, dairy, and wine). This is followed by aerospace; entertainment, primarily television by dollar volume, although many movies are still made in California; light manufacturing, including computer hardware and software; and the mining of borax. Per capita personal income was $48,460 as of 2005, ranking 13th in the nation. Per capita income varies widely by geographic region and profession. The Central Valley is the most impoverished, with migrant farm workers making less than minimum wage. Recently, the San Joaquin Valley was characterized as one of the most economically depressed regions in the U.S., on par with the region of Appalachia. Many coastal cities include some of the wealthiest per-capita areas in the U.S. The high-technology sectors in Northern California, specifically Silicon Valley, in Santa Clara and San Mateo counties, are currently emerging from economic downturn caused by the dot.com bust, which caused the loss of over 250,000 jobs in Northern California alone. Recent (Spring 2005) economic data indicate that economic growth has resumed in California at 4.3%. California levies a 9.3% maximum variable rate income tax, with 6 tax brackets. It collects about $40 billion in income taxes. California's combined state, county and local sales tax rate is from 7.25 to 8.75%. The rate varies throughout the state at the local level. In all, it collects about $28 billion in sales taxes. All real property are taxable and are assessed at fair market value at the time of purchase, limiting property tax income. California collects $33 billion in property taxes. California's vast terrain is connected by an extensive system of freeways, expressways, and highways. California is known for its car culture, giving California's cities a reputation for severe traffic congestion. Construction and maintenance of state roads and statewide transportation planning are primarily the responsibility of the California Department of Transportation ( Caltrans as it is commonly known). Caltrans builds tall "stack" interchanges with soaring ramps that offer stunning views. 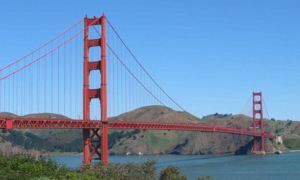 The state's most famous highway bridge is the Golden Gate Bridge. California also has several important seaports. The giant seaport complex formed by the Port of Los Angeles and the Port of Long Beach in Southern California is the largest in the country and responsible for handling about a fourth of all container cargo traffic in the United States. The Port of Oakland handles most of the ocean containers passing through Northern California. Intercity rail travel is provided by Amtrak. Los Angeles and San Francisco both have subway networks, in addition to light rail. Metrolink commuter rail serves much of Southern California, and BART and Caltrain commuter rail connect Bay Area suburbs to San Francisco. San Jose and Sacramento have light rail, and San Diego has Trolley light rail and Coaster commuter rail services. Nearly all counties operate bus lines, and many cities operate their own bus lines as well. Intercity bus travel is provided by Greyhound and Amtrak bus services. The rapidly growing population of the state is straining all of its transportation networks. A regularly recurring issue in California politics is whether the state should continue to aggressively expand its freeway network or concentrate on improving mass transit networks in urban areas. The California High Speed Rail Authority was created in 1996 by the state to implement an extensive 700 mile (1127 km) rail system. Construction is pending approval of the voters during the November 2008 general election, in which a $9 billion state bond would have to be approved. California is governed as a republic, with three branches of government: the executive branch consisting of the Governor of California and the other independently elected constitutional officers; the legislative branch consisting of the Assembly and Senate; and the judicial branch consisting of the Supreme Court of California and lower courts. The state also allows direct participation of the electorate by initiative, referendum, recall, and ratification. California follows a closed primary system. The Governor of California and the other state constitutional officers serve four-year terms and may be re-elected only once. The California State Legislature consists of a 40 member Senate and 80 member Assembly. Senators serve four year terms and Assembly members two. The terms of the Senators are staggered so that half the membership is elected every two years. The Senators representing the odd-numbered districts are elected in years evenly divisible by four, which corresponds to presidential election years. The Senators from the even-numbered districts are elected in the intervening even-numbered years, in the gubernatorial election cycle. California's legislature is organized in such that the party caucus leaders wield great power and can usually speak on behalf of their caucuses. Many important legislative decisions are thus not made on the floor of the legislature but in back-room deals by the " Big Five," which comprises the governor and the Democratic and Republican leaders of each chamber. Members of the Assembly are subject to term limits of 3 terms, and members of the Senate are subject to term limits of 2 terms. For the 2005–2006 session, there are 48 Democrats and 32 Republicans in the Assembly. In the Senate, there are 25 Democrats and 15 Republicans. The current governor is Arnold Schwarzenegger, who was re-elected to a term that lasts through January 2011. Most government elected offices are not considered competitive due to extensive gerrymandering. Schwarzenegger was only the second governor in the history of the United States to be put into office by a recall of a sitting governor (the first was the 1921 recall of North Dakota Governor Lynn J. Frazier). Schwarzenegger replaced Governor Gray Davis (1999–2003), who was removed from office by the October 2003 California recall election. The state's capital is Sacramento. During California's early history under European control, the capital was successively located in Monterey (1775–1849), San Jose (1849–1851), Vallejo (1852–1853), Benicia (1853–1854), and San Francisco (1862). 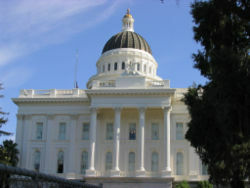 The capital moved to Sacramento temporarily in 1852 when construction on a State House could not be completed in time in Vallejo. The capital's final move to Sacramento was on February 25, 1854 where it has been located since, except for a four-month temporary move in 1862 to San Francisco, which was due to severe flooding in Sacramento. 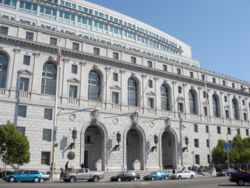 California's judiciary is the largest in the United States (with a total of 1,600 judges, while the state's federal system has only about 840). It is supervised by the seven Justices of the Supreme Court of California. Justices of the Supreme Court and Courts of Appeal are appointed by the Governor, but are subject to retention by the electorate every 12 years. Judges of the trial courts, the Superior Courts in each county, may be appointed by the Governor or elected directly by the voters, depending on when the vacancy occurs. Superior Court judges serve six-year terms, after which they may run for re-election. Unlike the retention elections for Supreme Court and Court of Appeal justices, Superior Court judges run for re-election in open races, in which other qualified candidates may run as challengers. California has an idiosyncratic political culture brought on by the diversity of its electorate. Having been the second state to legalize abortion in the 1960s and one of the first states to legalize domestic partnerships for gay couples, California also was the first state where voters said that only marriage between a man and a woman would be recognized. Its voters was the first to eliminate affirmative action through Proposition 209 but rejected Proposition 54, an initiative that would ban the state from collecting racial data in all but select circumstances. Voters approved California Proposition 187 (1994) to prevent illegal immigrants from receiving public services in the state (later overturned by a federal court) yet it provides them with in-state tuition for public universities. Illegal immigration remains a divisive issue with most liberals and a majority of Democrats want to expand legal rights for illegal immigrants, but widely opposed by many conservatives and a large percentage of Republicans. The state's African American vote remains mostly loyal to the Democrats; Latinos mobilized by the campaign around Proposition 187 formed a large and growing bulwark of the Democratic Party. Caucasians in the suburbs and rural areas are reliable for Republican candidates. Partisan loyalties have shifted in past twenty years with the once-Republican inner suburban strongholds in Los Angeles County and the Bay Area moving to the Democrats. Republicans count on the votes in fast growing Inland Empire and Central Valley to make up the difference. The most pronounced trend in partisan affiliation is the increase in voters who "decline to state", or not register with any political party. In 1994, only 10% declined to register with a party, that number is now 19%. California is currently considered a reliably Democratic state. Once very conservative, having elected conservatives such as Ronald Reagan as governor and William Knowland as senator, California has flipped sides in recent decades (beginning in the 1990's) and became a Democratic-voting state, having elected statewide liberals such as Dianne Feinstein and Barbara Boxer to the Senate. The latter is known for being one of the most liberal members of the U.S. Senate and has been active in left-leaning operations and progressive campaigns. Just as recently as 2003, Democrats controlled all but one elected statewide office and the legislature while Republican-appointed judges held all but one seat in the state supreme court. Since then, California has been moving back towards centrism re-electing its Republican governor and another Republican to a statewide office. Voters continue to vote down tax increases and expansion of government programs. California's legal system, like all other states (except Louisiana), is explicitly based on English common law but carries a few features from Spanish civil law, such as community property. Capital punishment is a legal form of punishment and the state has the largest " Death Row" population in the country (though Texas is far more active in carrying out executions). 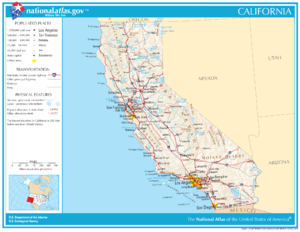 For lists of cities, towns, and counties in California, see List of cities in California (by population), List of cities in California, List of urbanized areas in California (by population), List of counties in California, and California locations by per capita income. The state of California has 478 incorporated cities and towns, of which 456 are cities and 22 are towns. The majority of these cities and towns are within one of four metropolitan areas. 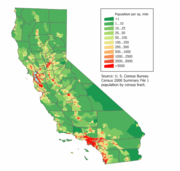 Sixty-eight percent of California's population lives in its two largest metropolitan areas, Greater Los Angeles and the San Francisco Bay Area. The state recognizes two kinds of cities-- charter and general law. General law cities owe their existence to state law and consequentially governed by it; charter cities are governed by their own city charters. Cities incorporated in the 19th century tend to be charter cities. All of the state's ten most populous cities are charter cities. The preeminent research university system in the state is the University of California (UC), which employs more Nobel Prize laureates than any other institution in the world, and is considered one of the world's finest public university systems. There are nine general UC campuses, and a number of specialized campuses in the UC system. California is also home to such notable private universities as Stanford University, the University of Southern California (USC), and the California Institute of Technology (Caltech). California has hundreds of other private colleges and universities, including many religious and special-purpose institutions. Public secondary education consists of high schools that teach elective courses in trades, languages, and liberal arts with tracks for gifted, college-bound and industrial arts students. California's public educational system is supported by a unique constitutional amendment that requires 40% of state revenues to be spent on education. California hosted the 1960 Winter Olympics at Squaw Valley, the 1932 and 1984 Summer Olympics in Los Angeles, as well as the 1994 FIFA World Cup. Los Angeles is currently competing to host the 2016 Summer Olympics. California has some fifteen major professional sports league franchises, far more than any other state. The San Francisco Bay Area has six major league teams spread in three cities, San Francisco, Oakland and San Jose. While the Greater Los Angeles Area is also home to six major league franchises, it is the largest metropolitan area not to have any teams from the National Football League. San Diego has two major league teams, and Sacramento has one. Home to some of most prominent universities in the United States, California has long had many respected collegiate sports programs. In particular, the athletic programs of the University of Southern California, University of California, Berkeley, UCLA and Stanford University are often nationally-ranked in the various collegiate sports. California is also home to the oldest college bowl game, the annual Rose Bowl, and the Pacific Life Holiday Bowl, among others. Each year, the California State Games take place here. In addition, many high school teams are often nationally-ranked.